This is the one cake niche that is never ‘standard’. I have supplied many corporate cakes in Manchester and further afield and every cake, by definition, has been unique. From cup cakes to large single entities, every cake has to marry into the brand that the company is trying to foster. There is no right way to do this it’s very much down to the company and individual event. A large reception may wish to have individual cup cakes saying something about there business, where a smaller affair could go for one central display cake. Or vice versa! 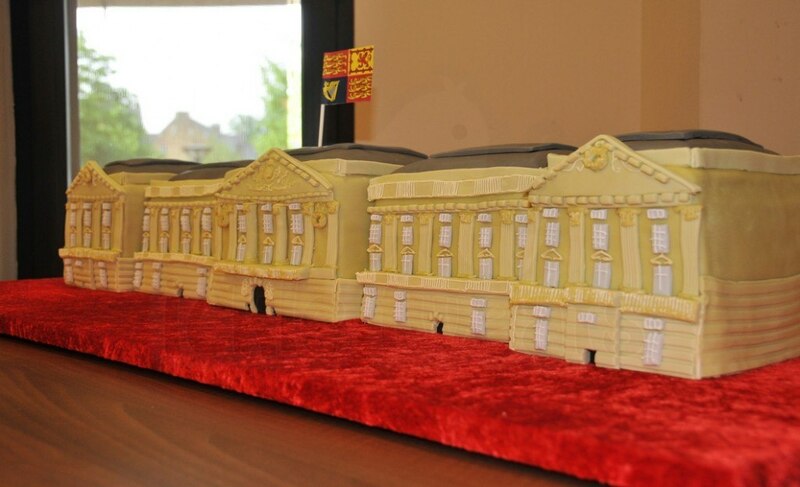 The Buckingham Palace Cake here was not exactly ‘typical’ but it sure does show what I can do! It was for a major international hotel chain, you probably know the one, made specially for a five hundred guest Diamond Jubilee Party. At the other end of the scale I find that individual corporate cup cakes branded with company logo’s or similar are really popular. Its really down to the event and of course your budget. Tell me what you are thinking then I can see what is possible. One thing to watch out for here is the deadline. Bespoke cakes like these, particularly if I need to make facsimiles of logos and so on, can take some time to get ready. Planning is the key so when you know that you are going to need a specially designed cake for your company event the sooner you make contact with me the better. Even if you do not know exactly what you need book the slot then we can talk. As I have indicated before I do not outsource, everything is hand made by me, it’s the only way I can be sure that you get the very best product so I need some time to prepare well. Please give me a call, tell me what you have in mind and I will do my up-most to deliver exactly what you need.